I've had an EE Quilt for the better of a year now and it was through the forum that I became aware of them. At the time I was looking for a sleeping system that would be comfortable, lightweight and compact. For whatever reason, I wasn't too keen on a sleeping bag and just so happened to come across the EE Quilts via a recommendation by our good friend Moondogg. If you are looking for something other than a sleeping bag, check these quilts. I haven't got anything to compare them to (aside from the raving reviews that undercling mike is getting for his handmade quilts), but these quilts are amazing. Mine is a long and wide quilt and is rated at 20 degree Fahrenheit. I've taken it to New Zealand during their summer and it got to the point where I almost slept without it as it was keeping me almost TOO warm. I really can't recommend these enough and am super grateful for having found them on this forum. They are impressive quilts, that's for sure. Both my wife and I have one (rated at -1degreeC), and on warmer nights we even join the two together (along with our STS mats). For cooler weather and colder sleepers, I would suggest at least a -6degreeC rating though. The fact you can adjust to allow to throw a leg out, or wrap around completely allows for some temp regulation during the night, which is handy. They are very light and compress down small. Just be sure you have space to store it as it must be stored to a storage sack and not compressed. 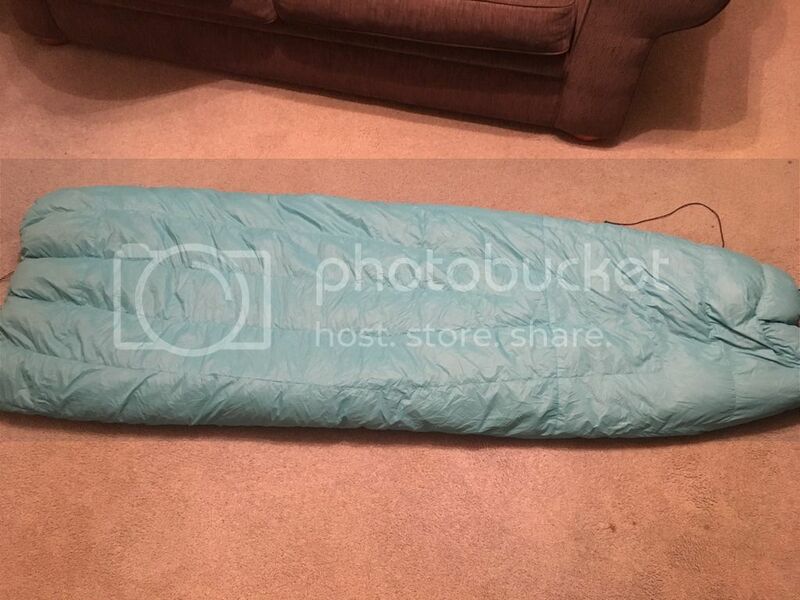 I have an Enlightened Equipment Revelation also. Love it. I got the 20 F / -6 degree Celcius rated. And as I have a baby daughter - now a toddler, I got the Extra Wide, as she has her own sleeping bag already but it means that in particularly cold weather I can put the quilt over the both of us for additional warmth and insulation layer over her. I love that it can be opened up as a duvet. Can stick a leg out if it's hot. Can cinch up the neck and strap it down in quilt mode if it's cold. And as a side-sleeper, who finds mummy bags a bit constrictive to sleeping, I love the versatility of the quilt. Thanks John. Looking forward to seeing my -6 Revelation land in about 6 weeks. The impression I got about EE is that they are focused on every aspect of their business. Great website, great design and quality, multiple options and very sharp pricing. I just received my long wide 20F Revelation today and the unpackaging experience was underwhelming to say the least. The box arrived small which was good. I carefully cut the packing tape so not to cause damage expecting a nicely folded rolled bit of UL goodness but nah. It was just scrunched in there. I pulled out the bag, which had a thousand crease marks and the bag, straps and storage bag fell out onto the ground. Most disappointing was the expectation of the Coyote outside which I envisaged to be a beautiful Bronze colour. Maybe under a warm light it might look brown but its Green! A khaki green! On top of that the inner yellow is translucent which means the down gives it a mottled look. OK but once again a bit of a letdown. And the down once puffed up was uneven. I fluffed about and evened out the down which was easy due to the translucent nature of the quilt and then went back to work. Lunchtime I blew up my mat, attached the straps, closed the foot well and climbed inside. Instantly I started feeling warm and begun working up a sweat. I’d taken a bit of risk ordering a wide instead of an extra-wide but the width proved to be good, rolled around and started feeling a bit happier. The clips where hard to unclip, maybe to avoid pre-release but that was another thing that didn’t quite seem right. On first impressions, the outer material is very delicate. I’ve learnt to look after my gear and that’s the price you pay for UL but the 10D they use obviously needs to be treated with a lot of care. The real reason for buying the Revelation was to cut weight and that it has done. Advertised at 600g in bag, weighted in at 600g exactly. You could compress a lot more than the bag they provide but I think it will work well. My bag/quilt goes into my pack first, so I think it will compress and mold to the contour of the pack and whatever sits on top. I’ve got a STS -6C bag I know well so if this quilt compares warmth wise, I’ll be very happy but EE really need to work on that first impression because it was not good. crollsurf wrote: Most disappointing was the expectation of the Coyote outside which I envisaged to be a beautiful Bronze colour. Maybe under a warm light it might look brown but its Green! A khaki green! On top of that the inner yellow is translucent which means the down gives it a mottled look. That does seem a bit disappointing. I checked the EE website and yep... the Coyote colour definitely looks brown to me as well.. Maybe they sent you the wrong colour by accident. Ive received gear which was labeled as small on the packaging and removable tags but the garment itself had medium on the fabric labels (and it was a medium). So mistakes can be made. My order of two EE quilts only came with one quilt. They did rectify this after an email, though. slparker, after waiting 4-6 weeks I think I'd be in shock if that happened. That's interesting Moondog. I thought it might vary from batch to batch. I've found it is a lovely Bronze in low light, dusk, early morning and then gets progressively Green as the light intensifies. I contacted EE about it and they said they get a lot of queries about it. Regarding the mottled yellow they said you get that with the lighter/brighter colours when using the "more affordable" 850DT grey duck down. I had a chuckle because many bag manufacturers don't even offer 850 Down or if they do, its there top line. I think he was suggesting the 900, 950 Down is white so you don't get the mottled affect. Maybe this info may help anyone thinking about an EE. But they are very light, warm, packable and the material is quite nice against the skin. I got one of these in black via Massdrop. It arrived already in the stuff sack and I'm very happy with it. Obviously I didn't have the colour variations that you experienced. Very warm and suits the hammock perfectly. crollsurf wrote: Maybe this info may help anyone thinking about an EE. But they are very light, warm, packable and the material is quite nice against the skin. Yep, an EE quilt for me and my wife was an excellent decision. I slightly miss the full snuggle effect of my old sleeping bag but my reality is that the quilt is just as warm and not as hot.... that is, it works like a bedcover should, adjusting temperature is far superior to a bag. I thought about going local and getting one of undercling mikes but at the time he didn't have the option of a zippable and drawstring foot-end that could be released into a true quilt. that may have changed; but, either way, a quilt is the way to go, at least for my outdoor activities. 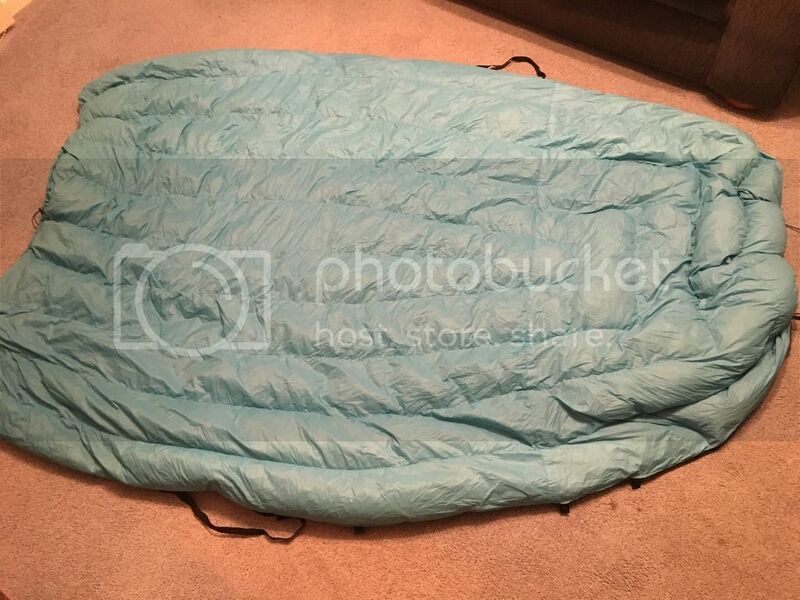 I never did see the sense of having down in the base of a sleeping bag and I don't really miss it. I'm looking at getting an EE enigma, does anyone with one of these quilts find issues with cold spots or drafts? Still use a feathered friends vireo so not sure if I'm really ready for a quilt thing.